This 26kw grid-tied photovoltaic array was installed at the GoodWill Hinckley school at no cost to them through a Power Purchase Agreement. The GoodWill Hinckley School in Hinckley, Maine and the Natural Resources Council of Maine have gone solar thanks to an innovative financing program now offered by ReVision Energy. Since nonprofits are ineligible for federal incentives, historically these projects have often relied on grant funding, which has become more scarce in recent years. While solar offers a great long-term solution for nonprofits, the upfront investment is often unrealistic as nonprofits prioritize incoming funds to manage pressing needs. This financing arrangement, called a Power Purchase Agreement (PPA) changes the tide completely by requiring no upfront investment from the nonprofit organization. 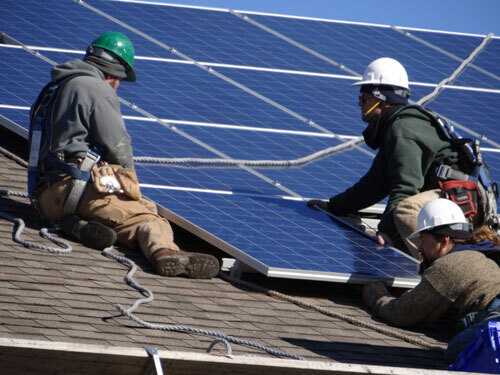 Under the PPA, ReVision Energy purchases, installs, and maintains the solar equipment hosted by the nonprofit. This allows ReVision to benefit from a suite of federal and state incentives that are unavailable to the nonprofit. The nonprofit, in turn, then purchases the clean, solar-generated electricity back at a competitive rate. ReVision’s crew installs solar panels at the Natural Resources Council of Maine. After a period of years, the nonprofit has the opportunity to purchase the solar energy system back at a substantial discount, resulting in a dramatically lower cost of electricity over the next 20 years. ReVision holds our commitment to helping New England transition away from fossil fuel energy to renewable sources very seriously. Offering this technology to nonprofit organizations is a key part of this vision, since these organizations fill a critical role in our communities and can lead by example in their adoption of solar energy. There has been a lot of excitement in the media about this unique financing model. See articles in The Bangor Daily News, The Morning Sentinel, TV coverage on WLBZ and some beautiful photos on the website of the Natural Resources Council of Maine. You can learn more about the GoodWill Hinckley School at: gwh.org.